Father John Bunea was selected, in spring 1990, permanent parish priest of the Romanian Orthodox Church "Saint George" in Toronto and was officially installed on September 16, 1990 by His Eminence, Bishop Nathaniel Popp. Born in Victoria, Brasov, Romania, Father John Bunea is a Graduate in Theology, graduating from the Faculty of Theology in Sibiu in 1979. He served as honorary deacon and then honorary priest within the Archdiocese Cathedral of Sibiu between 1980-1987 during which time he occupied the position of archivist in the Archives of the Archdiocese of Sibiu. On September 5, 1987 Father John Bunea comes to visit his sister in Hamilton and refuses to go back to Romania. Only on January 29, 1990 family manages to reunite when after two and a half years of separation, his wife Mihaela and his two sons - Ciprian-Ioan and Cătălin-Florentin arrive on Canadian soil. Moving to Toronto, he started to serve at the St. George Romanian Church. The reorganization of the parish began with patience, dedication and hard work, strongly denying any interference of political associations in the religious and administrative life of the parish. Making Saint George Church a true house of prayer, a place where Romanians gather in Toronto, trusting each other, in a real community, full of Romanian Christian spirituality, Father John Bunea, helped by the good faithful, loyal members of the parish and especially by the newcomers, managed to create premises for further development of the parish and the Community of Romanians. Thus, by donations and hard work, the entire building of the church was renovated: new roof, iron fence, complete renovation of interior adorned with new mural painting done by iconographer Nicolae Enache and painter Marian Verza from Sibiu. Following Father Bunea projects new works were executed: an new addition with three towers on the north side of the building, new iconostasis and pews, granite floors and marble and porcelain tiles. A general renovation of the "Dacia" Cultural Center was done, with columns, wallpaper and chandeliers, tables and chairs after a beautifully designed project of architect George Coica, currently in Spain. Father Bunea has not only initiated, designed and supervised the the projects, but he also took active part in their execution. 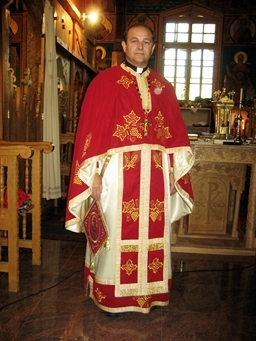 For all his work and activity, carried out with the help of the members of St. George Church, Father John Bunea was appointed "arhiprist" - Protopresbyter or honorary dean - by the blessing of His Eminence Nathaniel recognized by the Orthodox Church in America - "OCA" and was granted by His Grace Bishop Irineu with the distinction of stavrofor steward priest on behalf of the Diocese from Vatra.